Section 1. Term. The business and affairs of the Association shall be managed by a Board, all of whom shall be members of the Association. Individuals and entities who are employed by or affiliated with, or whose spouses or other immediate family members are employed by or affiliated with Stanmar, Inc., Smugglers’ Notch Management Co., Ltd., or any other corporation or business entity doing business at the Village at Smugglers’ Notch shall not be eligible to be members of the Board, unless elected by a two-thirds majority of the membership voting at an annual meeting. for more about the nominating and election of Board members see SNHA Bylaws Article V Sections 3 & 4. The Board derives it’s mission from the duties and powers listed in the SNHA Bylaws. (a) exercise for the Association all powers, duties and authority vested in or delegated to this Association by law, and not reserved to the membership by other provision of these By-laws, or the Articles of Incorporation. (b) appoint, employ and remove at pleasure an executive director, a manager, independent contractor, all officers, agents, employees, accountants and attorneys of the Association, prescribe their duties, fix their compensation and require of them such security or fidelity bond as it may deem expedient. The Board shall have the power to fix an executive director’s powers and duties including, but not limited to, the power of the executive director to engage employees and agents, who may or may not be independent contractors, and to define or limit the liability of the executive director, if any. Such delegation may (but need not) be sufficiently broad as to encompass the full range of power and duties of the Board including, but not limited to, the power to open and maintain bank accounts and write checks on behalf of the Board as directed by the Board. The executive director need not be a member of the Board. (c) enter into agreements, contracts, deeds, leases and other written instruments or documents in the name of the Association and authorize the execution, delivery and, if appropriate, the recording thereof. (d) purchase and carry out with the Association as a named insured, one or more package policies of insurance, with the nature and amount of such insurance being determined by the directors, covering Units for fire and extended coverage for the benefit of the Association, its members and their mortgagees and to collect from the members and pay over to the insurer premiums therefore and accept payment of insurance proceeds, settle claims and restore and/or replace damaged property and hire or appoint agents or independent contractors to do any one or more of the foregoing; provided, however, that in the exercise hereof the Association, its officers, directors, employees and agents shall assume no responsibility or liability whatsoever for any losses to persons or property which may occur whether or not due to the negligent performance or failure to perform by the Association, its officers, directors, employees or agents of any obligation arising from the exercise of such power, and the members agree to and shall indemnify and save harmless the Association, its officers, directors, employees and agents from and against all claims, lawsuits and losses caused or alleged to be caused by such performance or failure of performance. In exercising any powers hereunder, the Association is acting on behalf of and as an accommodation to the Owners to enable them to obtain favorable premium rates on a group bases. The final settlement of any claims with respect to damages to a Unit or Units shall be made in accordance with the Declaration and By-Laws governing the property or, in the absence of guidance from the Declaration and By-Laws, with the concurrence of the Owner. (e) enter into a contract with any firm, person or corporation, or join with other associations or condominium councils or similar entities in contracting for the maintenance and repair of the Properties, or portions thereof; and to contract for or join with such parties in contracting for the management thereof; and to delegate to the contractor or manager all the power and duties of the Board and the officers, except such as are specifically required by, the Articles or by these By-Laws, to have the approval of the Board, or the members. The contractor or manager may be authorized to determine the budget, make assessments for common expenses and collect assessments, as provided in, the Articles and these By-laws, subject always to the supervision and right of approval of the Board. (f) (Amended 7/4/87) select and appoint Members to serve as associate directors for a one year termin order to obtain a broader representation from the various condominium and townhouse regimes. Associate directors would also provide special skills or experience that will benefit the Board and the Association in their deliberations, and give interested Members experience in Board activities, thus providing a small pool of experienced replacements for future Board vacancies. Associate directors shall enjoy all the rights and privileges of Board Membership, except the right to vote. (g) act as agent for the Members to negotiate rental and management contracts including without limitation those with Smugglers’ Notch Management Co., Ltd., its successors and assigns, and generally to communicate on behalf of the Members with the entity(ies) managing the Village at Smugglers’ Notch. (h) provide Members with information regarding Village services, charges and procedures. 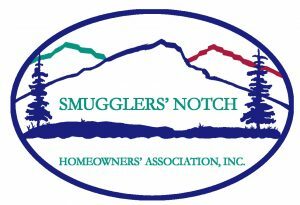 (i) act as managing agent for condominium associations and townhouse associations within the Village at Smugglers’ Notch. (j) assist membership in the maintenance and enjoyment of their units at the Village at Smugglers’ Notch. (a) adopt and publish rules and regulations, governing the use of the Units and the Common Areas and facilities, and the personal conduct of Members,Associate Membersand their guests thereon and (subject to the right of the membership to terminate or change the same) impose reasonable fees and assessments necessary to carry out the same,and to assess annual dues for Members and Associate Members. Annual dues shall constitute a lien against the properties of the Members and Associate Members, which lien shall be enforceable in the same fashion as common expenses assessed by condominium associations under Title 27 V.S.A. section1323. (b) suspend from membership an Owner during any period in which such Owner shall be in default for more than 180 days after notice, in the payment of any fees or assessment levied by the Association. (c) cause to be kept a record of all its corporate affairs, make such records available for inspection by any Member,Associate Member, or his agent, and present an annual statement thereof to the Members and Associate Members. (d) supervise all officers, agents and employees of the Association and see that their duties are properly performed. (e) designate depositories for Association funds, designate those officers, agents and/or employees who shall have authority to withdraw funds from such accounts on behalf of the Association, and cause such persons to be bonded, as it may deem appropriate. (f) fix annual dues (subject to the right of the membership to terminate or change the same) at an amount reasonably deemed sufficient to meet the obligations of the Association. (g) annually set the date(s) assessments and/or fees are due, decide what, if any, interest rate is to be applied to assessments which remain unpaid thirty (30) days after they become due. (h) procure and maintain adequate insurance to protect the Association, its employees and its personal and real properties, including liability insurance covering officers and directors; and require, at the cost of the Association, that all officers and employees handling or responsible for Association funds shall furnish adequate fidelity bonds. (i) appoint and remove committees and a registered agent and designate a registered office for the Association as prescribed by law. (j) exercise their powers and duties in good faith, with a view to the interests of the Association and to this end adopt appropriate guidelines for action on matters where a potential conflict of interest may exist.